What began as a simple act of kindness has turned into an outpouring of support and generosity by many. When we decided to create “Scrunch Wednesday” in honor of Mr. and Mrs. Becker, we had no idea how much people really cared. But more than 1,000 new Facebook followers, a packed house just about every night, and letters and gift card donations from all over the United States and abroad have told us you really do care about the treatment of our seniors and veterans. 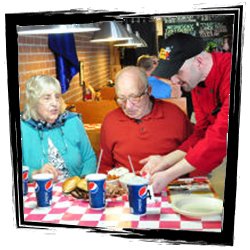 We can’t thank all of you enough for supporting our family owned and operated business, and we are giving 110% every day and night to keep up with demand. We are working hard to make upgrades to our staffing, operating systems and procedures to make sure you get taken care of just as quickly as possible. Your business means a lot to us, and we want to you know we will continue to do our best to take care of you. Please let us know when do take good care of you as well as how we can improve. Proud to be a member of the Culpeper community! Free coffee to ALL seniors and veterans on Scrunch Wednesdays. Come as you are and stay as long as you wish! Wednesday “scrunch time” is between our lunch and dinner hours.